Absolutely everything you need to know from the Google I/O Keynote! Today Google has had their annual announcement/press conference/ everything you need to know about Android day and along with that came the ever exciting keynote. This one in particular, was so good people on Twitter have literally been calling it the 'best keynote ever'! And lets find out why! It's hard to choose the best place to start with the sheer amount of events from today, but the widely rumoured Google tablet definitely did come to fruition, with a few very pleasant surprises too! Firstly, the specs of this 7 incher are very solid indeed. The screen has a resolution of 1280x800 and it's an IPS display, which is coated in "scratch-resistant Corning glass". At the moment we can only assume this is a variety of the extremely robust Gorilla glass. As well as this great screen, there's a front-facing, 1.2-megapixel camera, but no rear camera, which arguably isn't particularly useful on a tablet anyway! Inside there's 1GB of RAM, and NVIDIA's quad-core Tegra 3 SoC. Connectivity options are as diverse as you would expect thanks to the GPS, Bluetooth, 802.11b/g/n WiFi and Micro USB options and as a bonus there's NFC for all your Android Beaming needs.The battery is rated at 4325mAh and the usual spate of sensors: accelerometer, magnetometer, and a gyroscope are all present and counted for. The whole device has been squeezed down to 198.5 x 120 x 10.45mm and you have a choice of either 8 (£159 or $199) or 16GB (£199 or $249) of storage. This is an insanely cheap price for what you actually get here. The devices will be available on the Play store in the USA for pre-order now and the UK has the same option now too! And you can expect the device to land on your doorstep in mid-July! The video below is a brief introduction to the tablet and the new version of Android, which is called Jelly Bean or 4.1! This is the latest update to Google's Android Operating System and appears to be a minor upgrade over ICS. 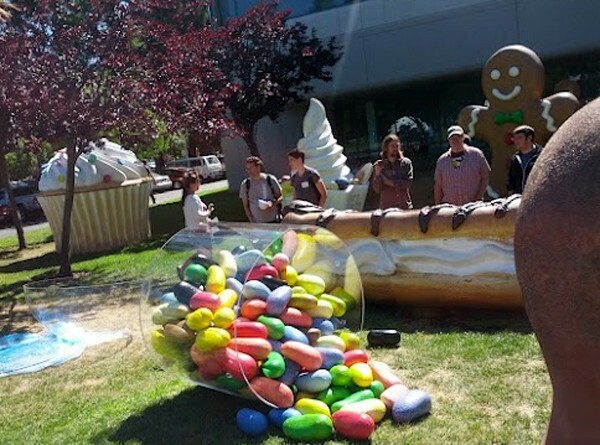 The update has been confirmed to be available on the Samsung Galaxy Nexus, Nexus S and Motorola Xoom in mid-July as an OTA update, and the SDK will be available today as part of a developer preview. One of the biggest features is Project Butter, a huge effort by Google to improve performance and response time. The whole system will be ticking over at 60fps from now on, and while the difference of a few miliseconds might sound minimal but, the guys over at Engadget have described it as 'glaringly apparently the moment you run Jelly Bean next to an ICS device', so it must be a very notable improvement. Animations are said to appear a lot smoother and quicker and your devices CPU immediately increases it's speed the second a touch is detected to ensure an almost immediate response. The home screen has also been reconfigured, with the addition of some clever features like dynamically resizable widgets, so you don't have to run through the steps of; placing, resizing and again placing it exactly where you want it. From now on if there is room on a home screen, but your app icons are a little in the way, the widget will automatically push them off to the side or to the next 'page'. Another nice touch, which is undoubtedly inspired by Mathias Duarte's efforts with WebOS, apps and widgets can now be removed by flinging them off the screen. Another highly useful addition is offline voice input. Now you can tap the microphone and dictate a message even with the phone in airplane mode, saving you time and your internet allowance! The camera app, which was really sold in ICS has been updated again in Andorid 4.1. The gallery's integration has been tightened up and looks great. It allows you to quickly pull up the photo you just took with a swipe to the left. You can continue swiping through your images or you can pinch to zoom out and view all your images in a filmstrip view. Deleting images is as simple as swiping a pic off the screen and, if you've manage to accidentally removed one, a quick tap of the undo button restores it, because we can see a lot of accidental swipes going on here. And both images and video can be shared using Google Beam, and Android now supports pairing with Bluetooth devices with the assistance of NFC. Google's first own-brand consumer electronics product is a small, sphere-shaped device that will work with the Nexus 7 tablet and other Android devices to stream media from the cloud. It's designed to take centre stage in a living room, preferably yours, with the ability to pull content from YouTube and the Google Play music app, among other services, allowing you stream music and video. Anyone with an Android device will be able to take control of the Q to play content from their library; basically, everyone can be the DJ. What's more, the device can double as an amplifier, letting users plug in external speakers to receiver power from the Q's 25-watt amp. The device will be powered by an OMAP 4460 processor, that's the same chips that's in the Galaxy Nexus, and there's also 16GB of storage and 1GB of RAM. The connectivity options include dual-band WiFi and Ethernet, together with Bluetooth and NFC for tapping a device to the Q to exchange software and media. The little streamer will go on sale for $299 in mid-July. Google will also offer up a set of $399 Triad bookshelf speakers to go with the Q, it's expensive by my goodness it's also uber cool! For those of you who care about employment opportunities, the Nexus Q will be entirely constructed in the United States! Google+ has 250 million users, more mobile users than desktop users interestingly! Google has announced Google+ Events. Google+ on Android and iPad have got specific tablet versions! Google Play has started offering movies, TV shows and magazines from today! Google has cut the price of the Galaxy Nexus to $349 and it now comes with Jelly Bean. 400 million Android devices have been sold in total, with 1 million activations per day! Google Play now has 600,000 apps and has had 20 billion downloads. Google's Project Glass has official availability for early 2013! The 'Explorer addition' which is demoed in the video below, will set you back $1500.